CIRCULAR No. 02/07/2018-Public dated Islamabad, the 1st February 2019 regarding Bank Holiday with All Public Holidays 2019 in A Year Calendar by the interior ministry government Pakistan. 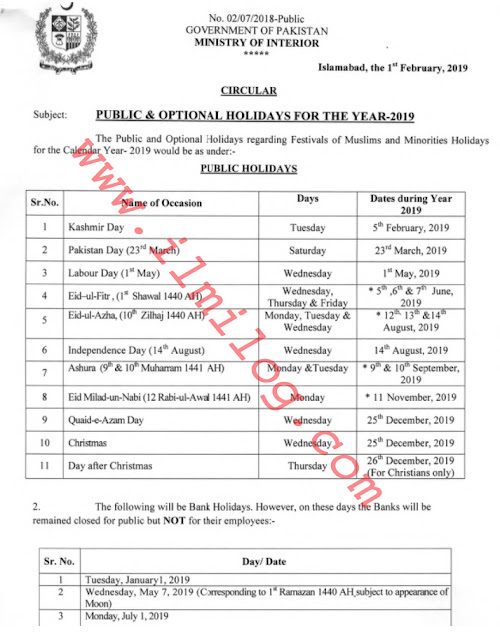 NOTE: In the case of Muslim Festivals the dates of Holidays are based on anticipated dates and are subject to the appearance of Moon for which a separate Notification will be issued by Ministry of Interior. 3. Servants working under Government craving to benefit themselves of *Optional Holidays* shall gross past permission of a Head of concerned office and no Servants working under Government shall be decided more than one *Optional Holiday* in the case of Muslims and three Optional Holidays for Non-Muslims in a Calendar Year-2019. 4. A concession grant should not affect any displacement of work. Muslim Optional Holidays case a number of people allowable to reward *Optional Holidays* should be controlled in a way so by way of to passable staff is obtainable for good extension of work. 5. The Optional Holidays are denominational and may be allowed at the discretion of the Head of Office, provided that work is not suffered. 6. A Government Servant should ordinarily be refined an Optional Holiday that is of religious significance to him and the refusal is likely to decrease the number of such holidays to which she/he is entitled. 1. President's Secretariat (Personal). OSD (Adam). Aiwan-e-Sadr. Islamabad. 2. President's Secretariat (Public), DS (Admin), Aiwan-e-Sadr, Islamabad. 3. Prime Minister's Office (Internal), OSD (Admin), Islamabad. 4. Prime Minister's Office (Public), DS (Admin), Islamabad. 5. The Chief Election Commissioner of Pakistan, Islamabad. 6. The Auditor General of Pakistan, Islamabad 7. The Auditor General of Pakistan Revenue, Islamabad. 8. The Joint Staff HQrs, Chaklala, Rawalpindi. 9. GHQ, Rawalpindi. 10. All Ministries / Divisions. II. The Registrar, Supreme Court of Pakistan, Islamabad. 12. Secretary, Senate Secretariat, Islamabad. II. Secretary, National Assembly Secretariat, Islamabad. It. Chief Secretaries, Government of Punjab (Lahore), Sindh (Karachi), Khyber Pakhtunkhwa (Peshawar). Baluchistan (Quetta). Gilgit Baltistan (Gilgit) and AMR (Muzaffarabad). 15. The Director-General, ISI, Islamabad. 16. The Director-General, IB, Islamabad. 17. The Chief Commissioner, ICT (Admin), Islamabad. 18. The Manager, State Bank of Pakistan, Islamabad. 19. Secretary, Wafaqi Mohtasib's Secretariat, Islamabad. 20. Secretary. Wafaqi Tax Ombudsman's Secretariat, Islamabad. 21. The Chairman CDA, Islamabad. 22. Director (Media), Minister of State for Interior, Islamabad with the request to ensure its publication in all Daily News Papers. 23. Director to Minister of State la Interior, Islamabad. 24. PS to Minister of State for Interior, Islamabad. 25. SPS to Secretary, Ministry of Interior. Islamabad. 26. PS to Special Secretary. Ministry of Interior. Islamabad. 27. PS to Additional Secretary-I, II & III, MA) Interior. Islamabad. 28. DS (Admn) Ministry of Interior, with the request to direct the System Administrator (IT) to upload said Press Release on the official website of this Minister.